Record man James Frazer after his 62 on the Montgomerie Course at Carton House. 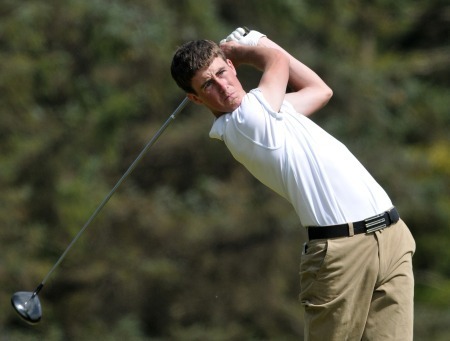 Picture by Pat CashmanWelshman James Frazer spectacularly scorched into contention for the Chartis sponsored European Individual Amateur Championship at Carton House when he shaved two shots off the course record with a sensational 10 under 62 on the 7,300 yard Montgomerie Course. The 25-year old from Pennard Golf Club in Swansea picked up four birdies on the front nine, bogeyed the 10th but then followed a birdie from 40 feet at the 11th with a scintillating finish of four successive birdies from the 14th followed by an eagle three from 30 feet at the last. Despite blustery conditions, he used the blade just 10 times in a homeward nine of six under 30 and single putted the last eight greens. “I played very, very solid and putting was the key today,” said Frazer after the lowest round of his career. Pontus Widegren shot 65. He was still three worse than Frazer. Picture by Pat CashmanSo high is the standard that his round was still only good enough to put him in a share of fourth on nine under par, four strokes adrift of 21-year old Pontus Widegren from Sweden, who shot a 65 to lead by one from 19-year old Portuguese international Gonçalo Pinto on 13 under par with Spain’s Juan Francisco Sarasti is solo third on 10 under after a 66. Waterford Castle’s Kevin Phelan and Rathmore’s Alan Dunbar will have to go low in today’s final round to have any chance of lifting the title. The Rathmore star’s push on the fourth missed the fairway by 90 yards, leading to a double bogey seven that was a millstone around his neck for the rest of the day. “A good round tomorrow and I can give myself a chance but I can only do my best and see what happens,” said Phelan, who is alone in eighth place. 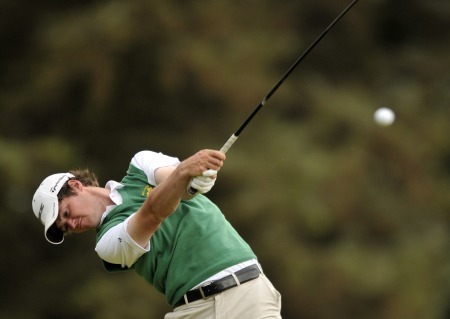 “I struggled a bit on the greens today but I feel good on the greens generally and hopefully I can hole a few. It would be nice to finish off well tomorrow with the Home Internationals to look forward to next week. Dunbar’s early double left him fighting an up hill battle but he did not blame his hectic schedule and did well to shoot a one under 71. But he might be too far back unless the leaders falter. ‘I just didn’t hit it great but got it round, Dunbar said. “If I hit it anywhere decent I’ll score because my short game is in good shape. I have to give myself chances and I didn’t today. “There are a lot of chances if you are hitting the ball decent. You wouldn’t want to be any more than seven behind but you can certainly shoot a low one. You can open up the throttle off the tee but you have got to put it in the right place. Frazer’s 62 completely overshadowed the course record-equalling 64’s shot by overnight leader Daniel Jennevret of Sweden on Wednesday and Dunbar on Thursday. James Frazer lets rip. 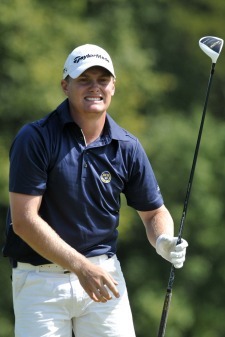 Picture by Pat CashmanThe 25-year old, who reached the quarter finals of Spanish Amateur earlier this year, holed a 30 footer at the first for birdie, picked up another shot at the par-five fourth, tapped in from a foot at the sixth and made another good putt at the eighth to turn in four under. After birdies at the 14th, 15th (where he missed a 15 footer for eagle) 16th and 17th, he was understandably pumped up on the par-five 18th and hit a 195 yard seven iron to 30 feet and watched his lag putt trickle into the hole. Frazer explained that he has had problems putting recently and decided to work on it after watching a putting exhibition from playing partners Wade Ormsby and Matt Nixon in Local Final Qualifying for The Open at St Annes Old Links. “I just noticed what they are like on the greens, if they weren’t able to tap it in, it was because they standing on someone’s line. It was just ridiculous how good they were on the greens, and that made me think to get to that level my putting has got to improve and definitely over the last six, seven weeks it’s been so good really. Kevin Phelan smooths another iron. Picture by Pat CashmanIronically, he credited TV talk about Padraig Harrington’s recent putting woes for the improvement in his technique. UCLA star Widegren was rightly pleased with his 65, explaining: “It was a great round, nine birdies and I wasn’t expecting nine birdies when I teed off today. “There was a little more wind out there today. I put my drive in the same bunker on number one as I did yesterday, and started with a bogey again, but I got things straightened out. Only five of the 17 Irish made the two over par cut with Portmarnock’s Geoff Lenehan (71) on one under, Lucan’s Richard O’Donovan (73) on level and Greystone’s Paul Dunne (73) two over. Shane Lowry finished sixth in the European Nations Championship at Sotogrande as England's Sam Hutsby beat Spain's Carlos Pigem Xammar at the first extra hole of a sudden-death play-off. Gary Hurley was delighted with his opening 68 at the Montgomerie Course. Picture: Pat CashmanWest Waterford’s Gary Hurley resisted the Montgomerie Course fear factor to save Ireland’s blushes on the opening day of the European Individual Amateur Championship at a sun-kissed Carton House. The cream of European amateur golf showed the bunker-strewn, 7,300 yard “inland links” zero respect and while Sweden’s Daniel Jennevret took command with a sparking course record-equalling 64, Hurley and his Munster team mate Geoff Lenehan were the only members of the 17-strong home challenge to break par.